A Cave under the Temple Mount's Foundation Stone? Descent under the "great rock" on Mt. Moriah (under the Dome of the Rock). 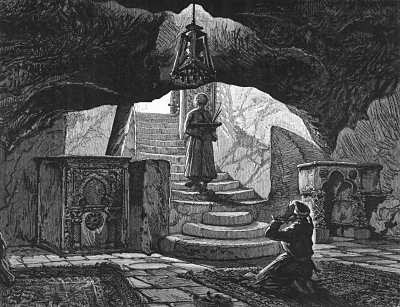 For centuries, the Temple Mount in Jerusalem has been the focus of worshippers, scholars and explorers. 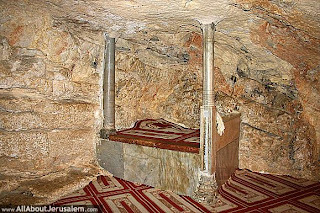 But few archaeologists have explored history's secrets hidden in the caves, tunnels and cisterns beneath the Hiram el-Sharif -- controlled by the Muslim Waqf. See also photo from American Colony Collection (circa 1900). "binding of Isaac" and the location of the Temples' Holy of Holies. Muslims believe it was from where Muhammad ascended to heaven. 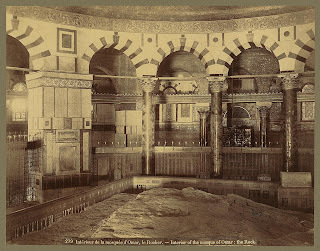 The Israel Daily Picture site provided last week photos from the Library of Congress archives taken after a 1927 earthquake destroyed parts of the el-Aqsa mosque. 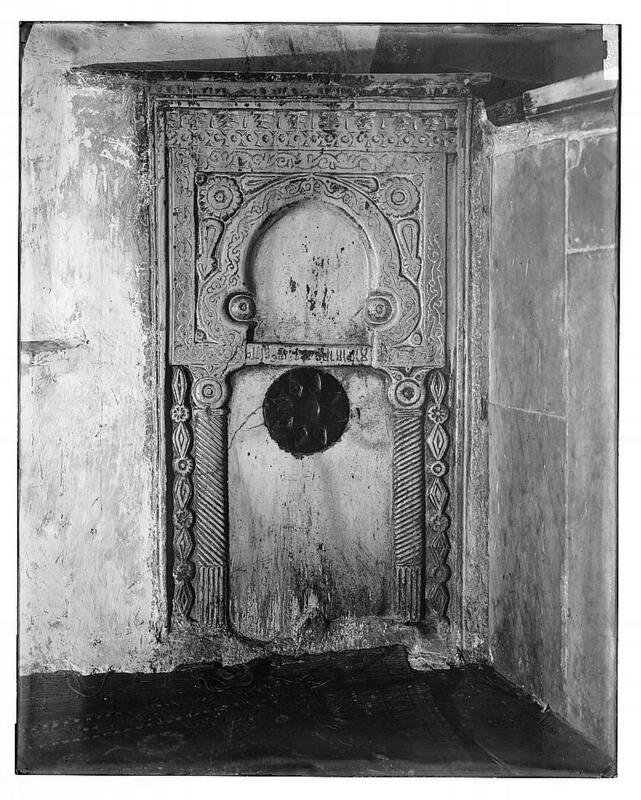 We were very curious when we discovered additional photos in the American Colony and Felix Bonfils collections showing the entrance to a cave beneath the "foundation stone" (even hashtiya in Jewish tradition) on which the Jewish Temples and the Mosque of Omar* were built. 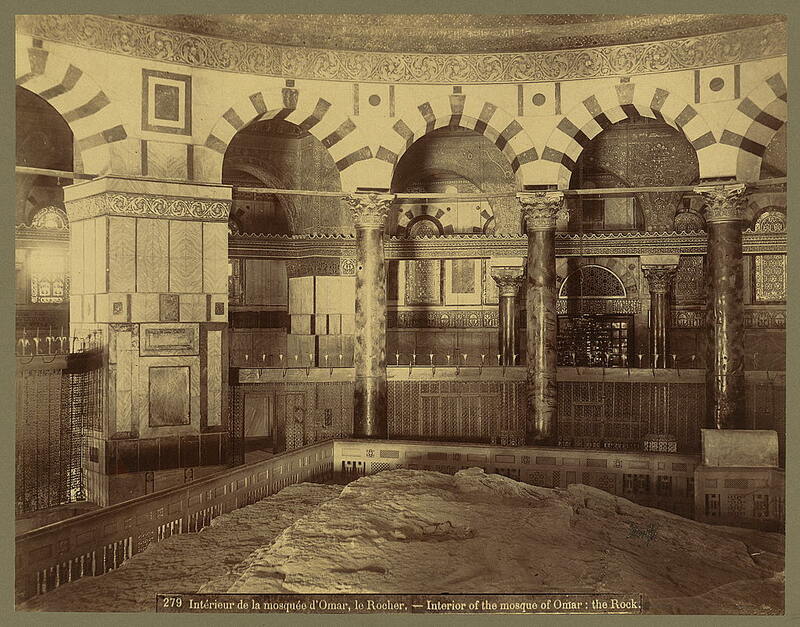 ﻿﻿The American Colony photos include a picture taken in the cave captioned "Solomon's prayer place under rock of Mosque of Omar [i.e., Dome of the Rock]." 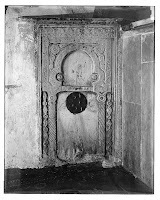 The prayer niche is more likely an ancient Muslim Mihrab pointing to Mecca. *According to National Geographic, "the dome, called Qubbat as-Sakhrah in Arabic, is not a mosque. Rather, it is a shrine built over the rock." There is a Mosque of Omar in Jerusalem, but it is located close to the Church of the Holy Sepulchre. It is better to refer to this building as the Dome of the Rock, as it is not even a proper mosque. And the Temple Mount (rather its top) is denominated Haram ash-Sharif in Arabic. The description from The Glorious Quran descripe exactly with regards to The Baitul Haram, Masjidil Haram and The Ka'ba. This is Bakkah, where The First House of our LORD, built by Prophet Abraham.